Day Thirteen / Hat Thirteen: Vintage brown woven fedora with beige silk hatband and jaunty turkey feather, size 7 1/4 circa 1960s. Label inside reads: "ADAM First Name in Hats." 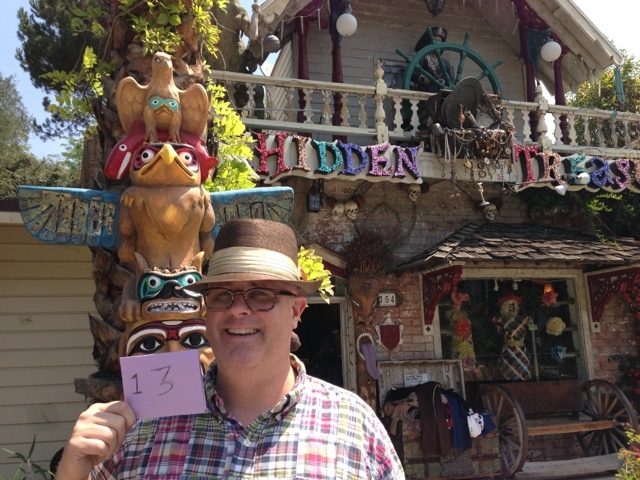 Purchased this hat today specifically for Project Cubbins from Hidden Treasures in Topanga Canyon. 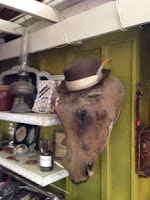 I found this one being worn by a stuffed and mounted boar's head as you can see below. I think that, in the long run, this place will be helpful, it turned out to be a motherlode of millinery -- including three different takes on the antique diving helmet I've previously mentioned.